One of the fun summertime things to do while staying at Uncle Billy Bob’s vacation rentals in Garden Valley, Idaho, is to spend the day in the giant pool at nearby Silver Creek Plunge campground. For a small fee, you and your friends or family can enjoy a unique pool setting that’s unlike your average, everyday pool elsewhere. If you’ve never visited a natural, geothermal hot springs before, Silver Creek’s pool, open 9 a.m. to 10 p.m. daily (except Wednesdays), is an uncovered outdoor pool that ranges in depth from about a foot deep to almost 6 feet deep. Water flows through it at a rate of 540 gallons per minute. Known as a “skim pool,” water enters the pool at 100 degrees and leaves at 97 degrees. The pool itself holds 180,000 gallons of water. Many visitors to Garden Valley make sure they make the 26 mile (from Crouch) trek up the gravel USFS road to visit the Silver Creek Plunge pool at least once for a warm, relaxing dip in the water. If you have had a long drive, your muscles are aching, and you want to unwind, the Silver Creek Plunge pool is like nature’s version of a giant hot tub. Have a soak in the clean, comfortable pool, as it’s one of the area’s top attractions worth a visit. After a good time at the pool, head back to your Uncle Billy Bob’s “redneck trailer,” which is also something a bit out of the ordinary, but in a good way, of course. For a truly memorable visit to Garden Valley, Idaho, the combination of the Silver Creek Plunge pool and a stay at Uncle Billy Bob’s makes for the kind of trip you won’t soon forget. 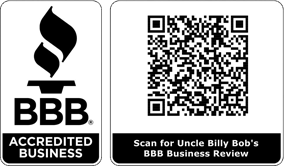 Call Uncle Billy Bob’s at 208-462-5BOB to make your trailer reservation today.